Painting Acrylic on Canvas | 27" x 33"
Painting Acrylic on Canvas | 28" x 40"
Painting Acrylic on Canvas | 21" x 42"
Children are the cradle of innocence and impish joy. Be it their mirthful laugh or the many castles in the air that they build, or their trusting embrace and their curious mind, there is so much inspiration to draw from them. Children from the larger theme of my compositions most of the times. I bring to my viewers, the pure, colourful world of children. In the few minutes that they spend with my work, I wish for them to feel the sheer happiness of being a child. Ramchandra B Pokale is a resident of New Delhi. He completed his art education from Nagpur University. He holds a master’s degree is Drawing and Painting and a bachelor’s degree in Fine Arts. 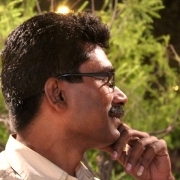 Ramachandra also holds an Art Teacher’s Diploma and is a bachelor of Commerce. He has been a part of over 25 group shows and solo shows in important venues such as Jahangir Art Gallery, Mumbai and Indian Habitat Centres amongst other places. His exceptional finesse in his compositions have earned him several awards over the years. He has been a recipient of awards such as the Bombay Art Society Award, Indian Academy of Fine Arts Award and many more. His works adorn homes and offices across the globe. Children are his greatest inspirations and he paints their dreams with colours like they form fairy tales.